Denmark pays considerable attention to the safety of preservatives in cosmetic products – it was the first European country to ban certain parabens from baby products. It has just published the results of a new assessment of their safety for health and the environment, carried out by its national Agency for environmental protection. Conclusion? Most preservatives are safe for use, although some of them may induce allergies or risks if they are overused. This survey was carried out by the Danish Environmental Protection Agency, part of the Ministry of Environment and Food, from July 2013 to August 2014. 2. To make an environmental and health assessment (screening) of the selected permitted preservatives, as well as a hazard and risk assessment of the selected permitted preservatives. A total of 639 different cosmetic products has been identified divided into groups ranging from sunscreens to powder to wet wipes. 31% did not contain preservatives, which may be because of the product's packaging and/or composition making preservation unnecessary. 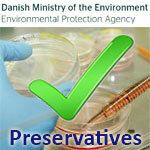 The survey identified a total of 53 preservatives used in cosmetic products on the Danish market. By comparison with previous studies of cosmetic products, it is seen that the use of parabens is decreasing. An environmental and health screening of 25 of the permitted preservatives was made. Generally, it is found that the published data for the selected preservatives are limited. Many of the available data are older (back from the 80s - 90s), and literature studies show that only very few new data have been published for the substances. The environmental screening showed that seven of the substances or the substance groups meet the criteria for either being persistent (P) or toxic (T) to aquatic organisms. These substances are Formaldehyde (T), Sulfites (expected P), Climbazole (P), mixture of 5-Chloro-2-methyl-isothiazol-3 (2H)-one and 2-Methylisothiazole-3 (2H)-one with Magnesium chloride and Magnesium nitrate (expected P), Chlorhexidine (P), Methylisothiazolinone (expected P) and Zinc pyrithione (T). None of the substances meet the criteria for being bioaccumulative (B). • Phenoxyethanol : France in 2012 assessed Phenoxyethanol to have a low margin of safety in terms of health effects, and not to be safe for use in children under the age of 3. The substance was therefore selected for further assessment, mainly based on the widespread use and because Phenoxyethanol in many cases probably replaces parabens and therefore may have an even larger prevalence. • Zinc pyrithione, partly because the substance may have harmful effects on the environment, partly because of its relatively low threshold for causing health effects. The risk assessments of Phenoxyethanol, DMDM Hydantoin, Imidazolidinyl urea, Zinc pyrithione and Thimerosal show that disregarding the sensitising risk by use of the substances, a product is safe to use even when the preservatives are added to the product in the maximum permitted amount. It generally applies to the study, that no cosmetic product in itself constitutes a risk. The hypothetical worst case scenario - that the substances were found in all cosmetic products used by adults and children in one day - showed no risk for DMDM Hydantoin, but showed a risk for Imidazolidinyl urea. But as Imidazolidinyl urea is used relatively rarely in cosmetics, the substance is not expected to pose a risk when used in the currently maximum permitted concentration of 0.6% compared to other health effects besides allergies. Zinc pyrithione and Thimerosal are only permitted in a few product types, and therefore a risk calculation using several products on the same day has not been conducted for these two substances. Contact allergy to preservatives is well described in the literature, and is one of the major causes of contact allergy to cosmetic products. For the selected preservatives in this project, the critical effect is also assessed to be allergy for several of them. It can be concluded that there is a risk of allergy by using cosmetic products containing 3 of the 5 preservatives investigated in this project (DMDM Hydantoin, Imidazolidinyl urea and Thimerosal). The phased out use of parabens may lead to the use of other, from an allergy perspective, more problematic preservatives. Especially the use of formaldehyde releasing preservatives - Quaternium-15, Diazolidinyl urea, DMDM Hydantoin or Imidazolidinyl urea - is assessed to pose a risk regarding allergies, and the release of formaldehyde from these substances and the consequent reflections on CMR (carcinogenic, mutagenic and reproduction toxic effects) should also be included in the overall assessment of the substances. If the underlying basis is the maximum permitted concentration of Phenoxyethanol (1%) in 14 mostly used everyday cosmetic products, it can be calculated that there is a risk associated with daily use of the 14 products both with and without the use of sunscreen. Based on a mandate from 22 April 2014 prepared by the Commission, the SCCS is currently assessing the safe use of Phenoxyethanol in cosmetic products. Overall, this study shows that most preservatives are safe for use in cosmetic products in the permitted concentrations - both by exposure to a single product or by daily use of several products containing the same preservative. However, there is a risk of induction of allergy by use of some of the permitted preservatives.